According to traditional Chinese medicine, there are many causes of menstrual cramps including pelvic tension or congestion, uterine inflammation or swelling, constipation, a contracted cervix, hormonal imbalances including imbalances of the thyroid and parathyroid glands and ovaries. Your thyroid, parathyroid and ovaries release hormones in your body that help to regulate your menstrual cycle. 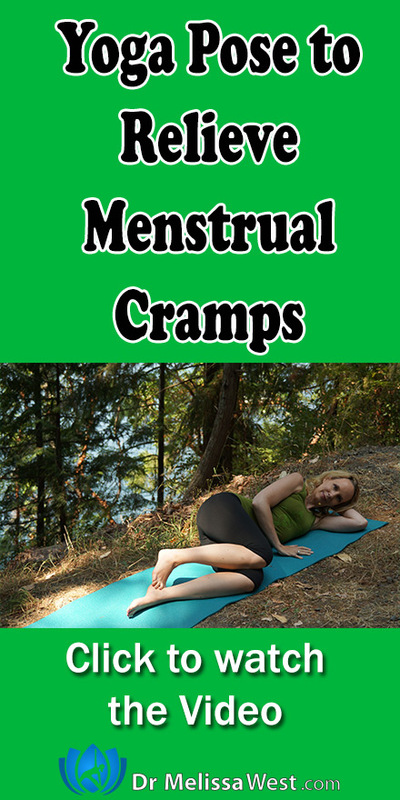 Today I am going to show you a pose you do in almost every yoga class to help you relieve menstrual cramps. About one quarter up your leg your are stimulating spleen six which will help with swollen abdomen, insomnia, menstrual cramps and nervous depression. Then below that you are stimulating kidney eight which will help with abdominal pain. On your ankle you are relieving menstrual cramps, nervous depression and swollen abdominal. If you would like more help with preventing menstrual cramps as well as classes for menstrual cramps check our membership community. We have two classes designed to help you prepare for your period with ovulation called Waxing to the Full Moon and another class for your menstrual period called Waning to the Dark Moon. Join our Membership Community Today. Next post: Do you have neck pain?